Practice handwriting: One line at a time COPYWORK provided in the Queensland Modern Cursive Font. Scripture verses are provided from the ESV (English Standard Version). Grade or Year 2 writing line size. Copywork is a great way for children to learn to handwrite in an accurate and beautiful format. By copying, a child will also pick up the correct spelling of words and grammar without realising. It is also to aid the development of their reading, concentration, attention and memory. In this case it is also a useful tool for scripture memory. Copywork is a common practice among those who homeschool using the Charlotte Mason Method/Approach of education. 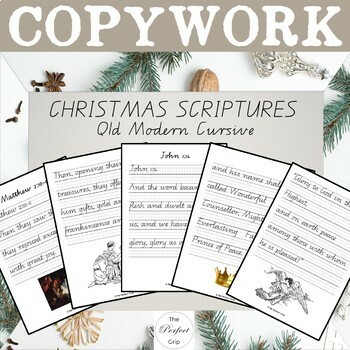 Keywords: handwriting, writing, copy work, penmanship, sentence structure, fine motor, scripture, lined, photos, images, photographs, practice, Christmas, Jesus, scripture.